HOW TO RESERVE OUR PRIVATE TAXI? You just have to fill in the Booking Form. It´s free, quick and easy. We recommend booking in advance in order to avoid availability problems. The service contracted is private and exclusively for you and your companions, never shared. If you have any questions, you can write us on our contact form or via WhatsApp at +34 633 951 238. Please note that if we are driving, we will not be able to take your call, so we advise you to write the query. It will be answered as soon as possible. WHEN TO BOOK OUR TAXI BACK? Tick the appropiate box when making the booking. When reaching your destination, agree with the driver the pick up time (three hours before the flight departure is advisable). We will need your flight number and date of departure (In this latter option, we can not guarantee availability). WHEN WILL YOU RECEIVE OUR CONFIRMATION OF YOUR PRE-BOOKING? In 12 hours máximum you will receive the confirmation of your booking. You need to confirm receipt of our email to formalize the hiring of service. Also, one day before your flight to Majorca you will be sent an email with some brief instructions. If you can´t find the confirmation of your booking in your inbox, it might be because your server has wrongly placed it in the SPAM folder. WHAT IS OUR PROMOTIONAL OFFER ? Benefit from our promotional Offer only this year 2019! If you hire the round trip, you will get up to 20% discount on the return journey to the airport. Depending on the destination reserved, a discount of 10%, 15% or 20% will apply. Consult our discount table. For example: Hiring our private taxi service to 'Playa de Son Moll', the one way journey will be 92€, but on the return journey will get a 15% discount, being 78€. In total, only 170 €! We offer you the cheapest Fares with the same price, both day and night, without extra supplements or surprises. Please note that fares are per vehicle, not per passenger. Check our price list. 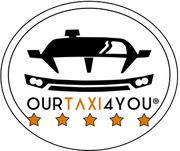 Can not find your destination, you can consult us by info@ourtaxi4you.com and we will reply within 12 hours. Only supplement: The price for each bicycle case will be 3€ per unit and per way. HOW MANY PASSENGERS CAN RIDE IN OUR TAXI? Our Taxi has a maximum capacity for four passengers plus the driver. YES, they do. Babies as well as children count as passengers and occupy a seat each one of them. According to the rules, adults are not allowed to carry babies or children on their laps. For this we have child chairs homologated according size and weight, at no extra charge. You just have to choose a choice on the booking form. WHAT LUGGAGE CAN YOU TAKE IN OUR TAXI? 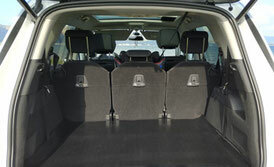 The vehicle has a large trunk of 700 liters. Even so, we need to know the exact load in advance in order to avoid setbacks. You just have to inform us when booking about the number of suitcases, if there are going to be any special suitcase, such as a wheeled chair, a pet carrier, golf clubs, etc. This kind of luggage has no extra cost. We currently transport a maximum of two bicycle cases, although it is compulsory to specify if it is rigid or flexible, as well as the exact measurements for the correct load (Length x Height). WHERE IS THE MEETING POINT AT THE PALMA AIRPORT (PMI)? This is the map of the meeting point in Palma airport, where we will be waiting you as soon as you have collected your luggage. We will be carrying a sign with your name. The meeting point is located between Exit C and the Information Point. You can see real updated images. WHAT HAPPENS IF YOU CAN NOT FIND OUR DRIVER OR THE MEETING POINT? Contact us at +34 633 951 238 and we will help. Don't worry as we have updated real time information of all flights operating in the Palma Airport. We will be waiting for you at the meeting point. Besides, the fares won't change. WHAT HAPPENS IF THE AIR COMPANY HAS LOST YOUR LUGGAGE? Are sorry this inconvenience. Contact us and let us know. You won't be charged any extra money either for the waiting or for the journey. WHAT HAPPENS IF YOUR FLIGHT IS CANCELLED OR DO YOU WANT TO CANCEL YOUR BOOKING? Are sorry this inconvenience. Contact us as soon as possible either to inform us of your new flight number and new date or to cancel the booking. All at no cost to you. We accept cash (€) or credit card (VISA or MASTERCARD). Payment will be made at the end of each service. You mustn't advance anything when booking. WHAT EQUIPMENT DOES OUR TAXI HAVE? Our vehicle has an official licence granted by the City Hall of Palma and permission interurban. Our car is new, modern, has full insurance, and it is equipped with dual zone climate control, USB charger, GPS, taximeter, POS, automatic windows, panoramic roof, spacious and comfortable interior, and large trunk. It's not allowed to eat, drink or smoke inside car.